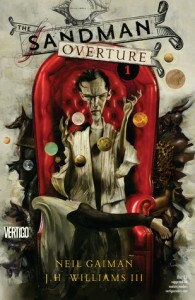 It has only taken Gaiman almost 2 years to release 6 issues of this last installment of Sandman. Really??!!!. I love Gaiman, especially his Sandman world but 2 years to do 6 comics is a bit much. The art work is just spectacular with vibrant colors and the lettering, although confusing, tells the story very well. This series is truly a work of art and I wont go so far to say worth the wait, but it is Dream after all so I guess it's not so bad. My weekend reading will be to read all 6 issues together and another addition to my bucket list is to get them signed by Mr. Gaiman of course.